DP-6880 is the largest capacity electric airless sprayer pump spraying putty sprayer gypsum or lime-based, this is the sprayer of choice for professional contractors , the high pressure airless paint sprayer (8L/min 4HP) is especially designed for spraying white cement, putty, lime based, drywall gypsum, mud, plastering, inorganic zinc coating and epoxy zinc-rich primer. It can even apply the whole range of primers and paints. *This Heavy duty airless paint sprayer equipped with 3 phase asynchronous motor, low round speed but very strong power. *Long-life chromate treatment Piston Rod, Sleeve, oversized Packings(Total 16pcs.). The Piston rod&V-packing are 4MM bigger than the DP-6850 which offer much more delivery volume. For heavy duty spraying jobs like putty spraying. *Build-in tool box for easy store up of the frequently-used tools and spare parts like tip, packing, filter etc. 1. Set password for each machine. 2. Saves more than 50% power. 3. Motor soft start and stop, stabilization, less impaction, NO temperature rise even after 8 hours working. 5. Motor speed adopts frequency conversion control according to the size of the tip & the viscosity of the paint. Per our Chat, kindly give us your best offer and if possible ready availability of Models DP633li and DP6336ib. Hoping for your early reply since we need the item as soon as possible. can this machine be used to spray cement based building paint like ‘Snowcem’ and what is the price for this machine. Hello! Can I buy you a machine DP-6880? What will it cost and how much is shipping to Russia? Thank you! hi sir,I’d like to know that what stanars accessaries includ in the package? what’s the easy worn parts for 6880 heavy-duty airless paint sprayer? 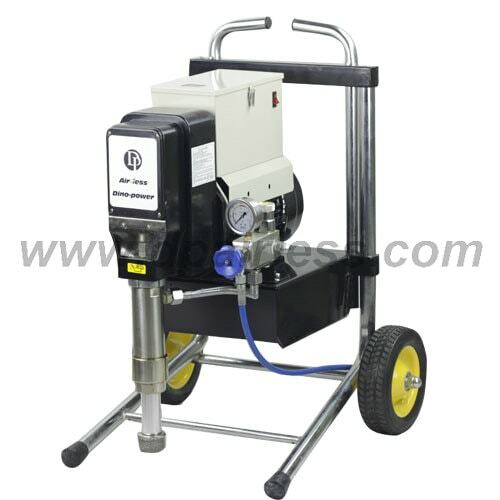 hi sir, I’m very interested in DP-6880 Heavy duty airless paint sprayer for putty plaster,I’d like to kniw if it can be connected two spray guns, if yes which nozzle size shoud be usd? pls confirm,thanks. where can I buy it in France or German?